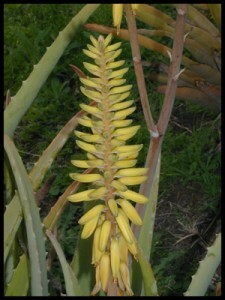 COMMON NAMES: Aloi, pänini ‘awa’awa [Hawai’i]; aloe [English]; lu hui, nu hui, no hui, xiang dan [China]; rokai [Japan]; rapahoe [Tahiti]; kumari, kattarvala [India]; ghui kumari [Nepal]; sink-am-bible [Creole]. CATEGORY: Downward draining herbs – purgatives. PROPERTIES: Bitter cold [China]; Leaves: bitter hot (?) moist. Gel: salty cool moist. Bitter, cool [India]. PLANT PART USED: Different parts of Aloe have different effects on the body. The yellow sap that emerges from near the skin of a sliced Aloe plant is called “bitter aloes” (luhui). It is dried, energetically cold, and used as an irritant laxative… a purgative. See Cautions and Contraindications. The Aloe gel from the center of the leaf is much milder. The gel is used internally to soothe the digestive tract and topically for burns. Not during pregnancy, menstruation, with hemorrhoids or liver / gall bladder degeneration. Long-term use can lead to loss of electrolytes, especially potassium. Long-term use can (rarely) lead to hyperaldosteronism, heart arrhythmias, nephropathies, edemas, and accelerated bone deterioration, albuminuria and hematuria. Not in rectal bleeding from cold deficiency. Pills powder or gel. Fresh or dried. Aloe vera leaf of length 15-18 cm. Boil in water and add sugar for oral use [China]. 1 leaf about 15 cm in length mashed and soaked in a cup of water for 20 minutes, then strained and drunk [Belize]. DOSAGE: Bitter aloes (luhui): 0.01-0.6 gram (laxative). 1.0 to 1.5 g (drastic). Gel: Topical as needed. Gel internal: 2-6 oz twice a day. STATUS IN HAWAI’I: Alien. No pest factor. Abortifacient (A. barbadensis) [Trinidad]; alterative; analgesic; antiashmatic; antibacterial; anticarcinogenic; antifertility; antifungal; antileukopenic; antipeptic ulcer; antipyretic; antiseptic (A. barbadensis) [Trinidad]; antithelmintic; antitumor; antiulceration; antiviral; aperient [Japan, Malaya]; aphrodesiac; bitter tonic; burn healing; cathartic (A. zebria) [China]; CNS depressant; decoagulant (A. barbadensis) [Trinidad]; demulcent (A. barbadensis) [Panama]; diuretic (A. barbadensis) [Haiti]; ecbolic (A. barbadensis) [Egypt]; embryotoxic; emmenagogue (A. barbadensis) [China, Egypt, India, Turkey]; emollient (A. barbadensis) [Haiti, Trinidad]; expels worms; hair stimulant; heals wounds; hypocholesterolemic; hypoglycemic; hypolipemic; insecitcidal; larvicide (A. barbadensis) [Haiti]; laxative (A. barbadensis) [Africa, Bahamas, China, Panama]; liver sedative; liver stimulant; local anaesthetic; mitogenic; promotes bile flow; promotes menstruation; purgative [Egypt, Haiti, India, Lesotho, Nepal, Trinidad, Turkey]; refrigerant; rejuvenative; removes stagnation; sedative; stimulant (A. barbadensis) [Haiti, Turkey]; stimulates appetite; stomachic [China, India, Spain]; stops bleeding; teratogenic; tonic (A. barbadensis) [Egypt]; uterine stimulant; vulnerary. 1) Clears heat and moves the bowels. 2) Drains heat and fire. 3) Clears liver heat and damp heat. 4) Cools the blood ~. 6) Promotes the menses ~. 7) Promotes healing and benefits the skin ~. 8) Benefits the digestion ~. OTHER ENERGETIC FUNCTIONS: For pitta and kapha (The gel is a tonic for excess fire.). Will aggravate vatta in low doses [Ayurveda]. Baldness (topical) [Ancient Greece, Belize, India]. Anemia, [China]; arteriosclerosis [Europe]; bleeding [China, Dominican Republic, India]; hemophilia [India]; varicose veins [Europe]. Inflammatory skin conditions [Haiti, India]; skin disorders, skin diseases [Europe, India, Native American]; eczema, [China, Europe]. Burns, sunburn (gel topical) [Universal]; blisters [Hawai’i]; rashes, bedsores, diaper rash, boils, scars, to prevent scarring;“black skin spots” [Belize]. Stomach disorders [Ancient Greece, Europe, Native American]; stomachache [Tonga]; indigestion, gas [Europe, Haiti (in rum), India]. Peptic ulcers and irritable bowel syndrome [Europe, India]; tenesmus [Russia]. To promote appetite and digestion [Caribbean]; obesity [India]. Diabetes [Europe, Haiti (in rum)]. Dental caries [China]; mouth and gum disease [Ancient Greece]. Eye infections and inflammation [Caribbean, Europe, India]. Headaches, migraine headaches [Africa, Ancient Greece, China, Java, Native American]. Jaundice, hepatitis [China, Dominican Republic, Egypt, India, Trinidad]; headache and delerium from hepatitis [China]; gall bladder stimulant [Egypt, Turkey]. Boils, carbuncles, sores (A. barbadensis) [Bahamas, Guatemala, Haiti]; infections [Europe]; fever [China, Egypt, Haiti, India, Malaya]. Scrofula [China]; enlarged spleen [India]; swollen glands [India]. Bruises [Bahamas, Mexico]; bursitis [India]; swelling [Africa, Bahamas, Malaya, Panama]; burns [Haiti, Malaya]; extraction of thorns (leaf topical, change bandage.once per day for 3-5 days) [Belize]; wounds [Africa]; sacral pain [Russia]. Convulsions (adult and infantile) [China, India]; irritability, dizziness [China]. Cancer [India, Samoa]; leukemia [China]; throat cancer [USA]. Intestinal parasites [China, Europe, India, Native American]; malnutrition due to parasites [China]; ringworm [Africa, China]; roundworm [China]; threadworms [Native American]. Colic [Europe]; infantile malnutrition [China]; extracts of leaves used to stop children from biting fingernails [Carribean]; used by nursing mothers to purge a child [Europe]; put on the breasts during weaning [Caribbean]; infantile convulsions (adult and infantile) [China, India]; irritability or dizziness [China]; pertussis [China]. Bleeding [India]; late menstrual period [Caribbean, Europe, India, Native American]; late period with constipation [USA]; painful menses [India]; prolapsed uterus [Russia]; vaginitis [India]. Venereal diseases [India]; syphilis [South Africa]. Asthma [Amboina, Curacao, Egypt, Haiti, India, Samoa]; chest congestion [Java]; cough [Egypt, Java]. Common cold [Bahamas, Barbados, Curacao, Haiti, India, Jamaica, Lesotho]; influenza (A. saponaria) [Lesotho]. Painful urination [India]; edema [Bahamas]. Topical for cuts on dogs’ paws (Wrap sliced leaf around wound and bandage. Change daily) [USA]. 1,8-dehydroxyanthraquinone, acemannan, aldopentose, aloe peptides, aloe-emodin, aloeferon, aloin (also called barbaloin), aloin derivatives, amino acids, aminoacids. anthranols, anthraquinones, anthrol, anthrones, barbaloin, benzothiazolone, calcium oxalate. campesterol, cholesterol, chrysophanic acid, cyclohexane derivatives, dehydro-abietal, emodin, enzymes, glucomannan, glucose, isocitric acid, lipids, lupeol, methyl esther of dehydro-abietic acid, organic acids, para-coumaric acid, stigmasterol, sugars. Can cause potassium deficiency when used with thiazide diuretics, licorice, and corticosteroids [Brinker 2001]. This can increase toxicity of digoxin [Brinker 2001; Chen 2004]. Potentiates the hypoglycemic effects of glibenclamide, and (topically in mice) the anti-inflammatory effects of topical hydrocortisone [Okyar 2001]. Can cause a strong odor when used for radiation burns [Leonard 2003]. Headaches, irritability, and flank pain (“heat in the liver meridian”): With Gentiana scabra (long dan cao) and Scutellaria baicalensis (huang qin) [China]. Worms: With Quisqualis indica [China]. Eczema: With Glycirrhiza uralensis (gan cao / licorice), topical [China]. Radiation exposure: With Eucalyptus spp. (nuholani) or castor oil topical [Hutchens 1983]. To prevent intestinal irritation: With Hyoscyamusspp., Humulus spp. (hops), or Ipecacuanha spp. [Europe]. Colds, asthma, and for bruises: Beaten with egg whites and taken internally[Trinidad]. Stomach ulcers: Juice with seawater [Trinidad]. HABITAT: In a pot on your windowsill. GATHERING: Can be smelly and messy. Accelerates wound healing in humans [Visuthikosol 1995, Davis 1989(c)], and in rats [Somboonwong 2000; Chithra 1998; Heggers], possibly due to the glycoprotein content [Choi 2001]. In another study of wound healing, 100mg / kg was given to mice for 2 months with no mention of toxicity but a reported decrease in wound diameter of 62.5% [Davis 1989]. Useful for burns [Visuthikosol 1995]. May reduce inflammation in burns via reduction of cytokines and leukocyte adhesion [Duansak 2003], and increases microcirculation [Somboonwong 2000]. Anthraquinones are anti-inflammatory (inhibiting arachidonic acid) [Vazquez 1996; Davis1989(a); Davis 1989(b)]. Anti-oxidant [Malterud 1993; Yagi 2002; Saada 2003]. Antineoplastic. Acemannan, a substance in aloe, increases immunity in mice whose immune systems had been damaged by radiation [Shimpo 2000, 2002; Saada 2003]. Some constituents are antimutagenic against leukemia & neuroectodermal tumors [Lee / Hong 2000(a); Lee / Kim 2000(b); Pecere 2000], inhibit chemical hepatocarcinogenesis [Shamaan 1998], and pancreatic cancer in lab animals [Furukawa 2002]. Extract is immunoregulatory [Qiu 2000; Womble 1988]. May prevent ultraviolet radiation (UBV) induced immune suppression in the pancreas and in the skin [Lee / Han 1997]. May prevent pancreatic tissue damage in lab animals [Beppu 2003; Furukawa 2002; Lee / Han 1997]. The leaves (but not gel) lower blood sugar in IDDM and NIDDM rats [Okyar 2001]. Aloes (the concentrated sap) also lowers blood glucose [Ghannam 1986]. Aloe inhibits hepatotoxicity, [Norikura 2002; Corsi 1998] and lowers hepatic cholesterol in rats [Lim 2003]. Antiviral for Herpes 1 & 2 [Arvigo 2001]. Aloe gel is being researched as a battlefield blood substitute to prevent hemorrhagic shock in wounded soldiers. The results in lab animal studies look promising [Macias 2004]. “I have perfumed my bed with myrrh, aloes, and cinnamon (Proverbs 7:17). Greek physician Dioscorides wrote of Aloe for constipation, burns and kidney ailments. Pliny (Caius Plinius Secundus, A.D. 23-79) recommended rubbing the leaves on male genital ulcers [Greece]. Mentioned in the New Testament as a purgative (John 19:39). Napolean’s wife Josephine used a milk / aloe gel lotion for her skin. It was used by Cleopatra for the same reason, and also used in Egyptian embalming processes [Egypt]. Indigenous to the Sudan. Aloe ferox is indigenous to South Africa. In the African Congo Slukari hunters rub aloe over their bodies to hide their scent. Related species are used as an antidote to poison arrow wounds. In India prepared aloe gel with honey and spices is called Kumaryasava and is used for anemia, poor digestion, and liver problems. Kumari means “young girl” or “virgin.” Aloe is thought to bring the energy of youth and renewal to women. Arvigo, Rosita and Nadine Epstein. 2001. Rainforest Home Remedies : The Maya Way To Heal Your Body and Replenish Your Soul. San Francisco: Harper. Bensy, Dan, & Andrew Gamble. 1986. Chinese Herbal Medicine: Materia Medica. Seattle: Eastland Press. Beppu H, Koike T, et al. 2003. Radical-scavenging effects of Aloe arborescens Miller on prevention of pancreatic islet B-cell destruction in rats. J Ethnopharmacol. Nov;89(1):37-45. Brinker, Francis. 2001. Herb Contraindications and Drug Interactions. Sandy, OR. : Eclectic Medical Publications. Chen, John K., and Tina T. Chen. 2004. Chinese Medical Herbology and Pharmacology. City of Industry CA: Art of Medicine Press, Inc.
Chithra P, Sajithlal GB, et al 1998. 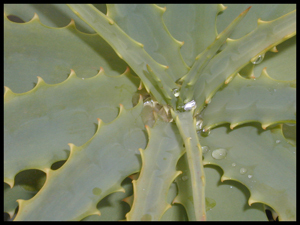 Influence of Aloe vera on collagen turnover in healing of dermal wounds in rats. Indian J Exp Biol. Sep;36(9):896-901. Choi SW, Son BW, et al. 2001. The wound-healing effect of a glycoprotein fraction isolated from Aloe vera. Br J Dermatol. Oct;145(4):535-45. Corsi MM, Bertelli AA, et al. 1998. The therapeutic potential of Aloe vera in tumor-bearing rats. Int J Tissue React.;20(4):115-8. Davis RH, Leitner MG, et al. 1989(a). Anti-inflammatory activity of Aloe vera against a spectrum of irritants. J Am Podiatr Med Assoc. Jun;79(6):263-76. Davis RH, Rosenthal KY, et al. 1989(b). Processed Aloe vera administered topically inhibits inflammation. J Am Podiatr Med Assoc. Aug;79(8):395-7. Davis RH, Leitner MG, Russo JM, et al. 1989(c). Wound healing. Oral and topical activity of Aloe vera. J Am Podiatr Med Assoc. Nov;79(11):559-62. Duansak D, Somboonwong J, Patumraj S. 2003. Effects of Aloe vera on leukocyte adhesion and TNF-alpha and IL-6 levels in burn wounded rats. Clin Hemorheol Microcirc.;29(3-4):239-46. Furukawa F, Nishikawa A, et al. 2002. Chemopreventive effects of Aloe arborescens on N-nitrosobis(2-oxopropyl)amine-induced pancreatic carcinogenesis in hamsters. Cancer Lett. Apr 25;178(2):117-22. Ghannam N, Kingston M, et al. 1986. The antidiabetic activity of aloes: preliminary clinical and experimental observations. Horm Res.;24(4):288-94. Lee CK, Han SS, et al. 1997. Prevention of ultraviolet radiation-induced suppression of accessory cell function of Langerhans cells by Aloe vera gel components. Immunopharmacology. Oct;37(2-3):153-62. Lee KH, Hong HS, et al. 2000. Induction of apoptosis in human leukaemic cell lines K562, HL60 and U937 by diethylhexylphthalate isolated from Aloe vera Linne. J Pharm Pharmacol. Aug;52(8):1037-41. Lee KH, Kim JH, et al. 2000. Anti-leukaemic and anti-mutagenic effects of di(2-ethylhexyl)phthalate isolated from Aloe vera Linne. J Pharm Pharmacol. May;52(5):593-8. Leonard D. B. 2003 Author’s conversations with cancer survivors. Lewis, Walter Hepworth. 1977. Medical Botany: Plants Affecting Man’s Health. New York: John Wily & Sons. Lim BO, Seong NS, et al. 2003. Efficacy of dietary Aloe vera supplementation on hepatic cholesterol and oxidative status in aged rats. J Nutr Sci Vitaminol (Tokyo). Aug;49(4):292-6. Macias CA, Kameneva MV, et al. 2004. Survival in a rat model of lethal hemorrhagic shock is prolonged following resuscitation with a small volume of a solution containing a drag-reducing polymer derived from Aloe vera. Shock. Aug;22(2):151-156. Malterud KE, Farbrot TL, et al. 1993. Antioxidant and radical scavenging effects of anthraquinones and anthrones. Pharmacology. Oct;47 Suppl 1:77-85. Mindell, Earl. 1992, 2000. Earl Mindell’s New Herb Bible. Rev ed. New York: Fireside. Norikura T, Kennedy DO, et al. 2002. Protective effect of aloe extract against the cytotoxicity of 1,4-naphthoquinone in isolated rat hepatocytes involves modulations in cellular thiol levels. Pharmacol Toxicol. May;90(5):278-84. Pecere T, Gazzola MV, et al. 2000. Aloe-emodin is a new type of anticancer agent with selective activity against neuroectodermal tumors. Cancer Res. Jun 1;60(11):2800-4. Qiu Z, Jones K, et al. 2000. Modified Aloe barbadensis polysaccharide with immunoregulatory activity. Planta Med. Mar;66(2):152-6. Saada HN, Ussama ZS, Mahdy AM. 2003. Effectiveness of Aloe vera on the antioxidant status of different tissues in irradiated rats. Pharmazie. Dec;58(12):929-31. Shamaan NA, Kadir KA, et al. 1998. Vitamin C and Aloe vera supplementation protects from chemical hepatocarcinogenesis in the rat. Nutrition. Nov-Dec;14(11-12):846-52. Shimpo K, Chikako T, et al. 2000. Inhibition of N-ethyl-N’-nitro-N-nitrosoguanidine-induced Duodenal Tumorigenesis in Mice by Whole-leaf Aloe arborescens Miller var. natalensis Berger. Asian Pac J Cancer Prev.;1(4):283-288. Shimpo K, Ida C, et al. 2002. Aloe arborescens extract inhibits TPA-induced ear oedema, putrescine increase and tumour promotion in mouse skin. Phytother Res. Aug;16(5):491-3. Somboonwong J, Thanamittramanee S, et al. 2000. Therapeutic effects of Aloe vera on cutaneous microcirculation and wound healing in second degree burn model in rats. J Med Assoc Thai. Apr;83(4):417-25. Vazquez B, Avila G, et al. 1996. Antiinflammatory activity of extracts from Aloe vera gel. J Ethnopharmacol. Dec;55(1):69-75. Visuthikosol V, Chowchuen B, et al. 1995. Effect of Aloe vera gel to healing of burn wound a clinical and histologic study. J Med Assoc Thai. Aug;78(8):403-9. Womble D, Helderman JH. 1988. Enhancement of allo-responsiveness of human lymphocytes by acemannan (Carrisyn). Int J Immunopharmacol.;10(8):967-74. Yagi A, Kabash A, et al. 2002. Antioxidant, free radical scavenging and anti-inflammatory effects of aloesin derivatives in Aloe vera. Planta Med. Nov;68(11):957-60.